Here we are, starting our Holiday mystery at Bedecked and Beadazzled just a week before Thanksgiving. Did I actually say a week before Thanksgiving? Yes, I did. There are trees to be decorated. Gifts to be wrapped and most importantly to us silly stitchers pastel colored trees to needlepoint! 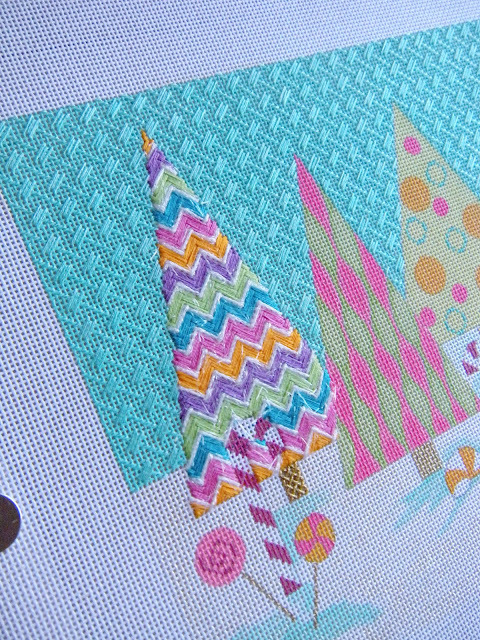 I better get a move on designing the stitches and fun for this piece. 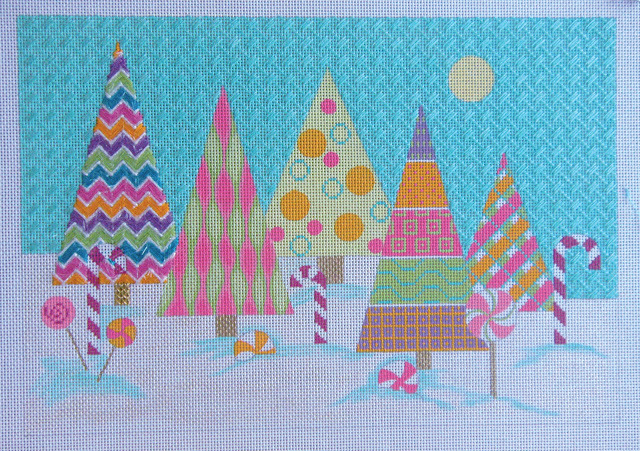 The EyeCandy Candyland Christmas Tree Farm is a delight to stitch. Ada designed it in such a way that it is perfectly painted. The colors are clear and fresh and there’s lots of room for me to play with the sparklies that I love. We started the class with the zig zag tree on the left. You know I love the colors of this tree and it totally reminds me of Missoni. 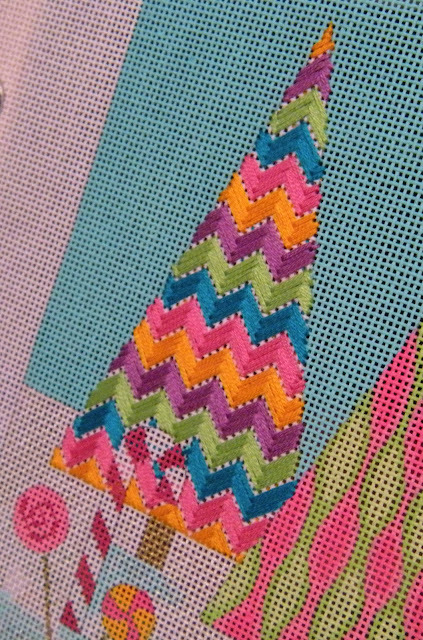 Yes, I loved Missoni well before the Target ads. It’s a simple stitch once you get the first row in place. If you are doing this with us long distance, please count carefully on the first row. Each stitch is on a perfect diagonal. Notice how all the peaks and valleys line up. That’s what makes the tree look like it is zig zagging right off the canvas. Once the tree is complete we frosted the edges of the branches with Arctic Rays. The sky is the next part of the canvas to be transformed. One ply of overdyed embroidery floss with one strand of Accentuate gives it just a little bit of shimmer. Are we finished with the sky? Who knows, I may just decide we need a little extra sparkle. You’ll have to wait until the next lesson to see what I decide. To everyone who is doing this class, thank you for joining us. To the ladies who came to class today thanks for coming to play. We love seeing you and stitching with you. This week we were honored to have two ladies from Connecticut join the party. Can’t wait to see you girls again.